There were two new Boone Central records set. Athletes turned in a whopping 27 season-best marks. 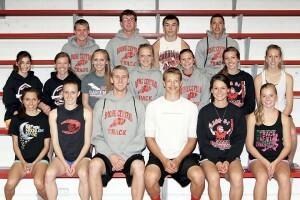 Seventeen Cardinals qualified for the 2015 Nebraska State Track and Field Championships. A second consecutive girls district title won. All in all, a banner day for Boone Central/Newman Grove at the B4 District track and field meet in Pierce. “The kids were determined to make their mark in the district meet. Their hard work, dedication and desire to compete paid off,” praised Card Coach Kris Pestel. Catherine Weeder led the Lady Cardinal charge to the championship, qualifying for the state meet in four events. She broke the one minute mark in the 400 meter dash for the first time this season and was a member of the 4×400 relay team that set a new school record (Boone Central) of 4:06.50. Other 4×400 runners were Taylor Starman, Sheldon Beierman and Dana Pelster. Beierman and Starman both qualified for state in three events, Beierman winning the 100 and 300 meter hurdles and Starman capturing 800 meter gold. Beierman broke her own Boone Central record in the 100 hurdles with a 15.22 clocking. Damian Backus also qualified in three events, including a runner-up finish in a sizzling 100 meter final. A terrific day ended with Zac Glidden edging Wayne’s Tayib Toussaint in a head-to-head sprint duel in the final stretch of the 4×400 meter relay, securing the final automatic state berth in the event with a runner-up finish.